NASA Headquarters managers face an imminent decision to formally halt further extraction maneuvers by the Mars rover Spirit to conserve electricity and to save the rover's life while it remains stuck in a sand trap 61 million miles from Earth. After six years of roving, Spirit's continued survival on Mars is now an open question as this marvel of robotics, human affection and ingenuity now risks freezing to death in the weeks ahead. "Right now there is no assurance we will get through the winter because power predictions are looking quite challenging for the rover sitting at its current attitude," says John Callas, rover project manager at the Jet Propulsion Laboratory, Pasadena Calif.
"The reality is we are running out of time," Callas tells Spaceflight Now. "There is less and less power for the vehicle every day that goes by because we are getting closer and closer to low winter Sun angles," Callas says. Without that power we can not run the heaters positioned in the rover's body beside critical electronics. "We are very close to saying that we have tried everything that we could have possibly tried to drive out of the sand trap," says rover principal investigator Steve Squyres of Cornell University. In reality, the issue has changed from whether the rover can be freed ever to rove again. The issue now is whether it can generate enough electric power while stuck to keep from freezing to death in the coming months -- an increasingly dire situation. This critical juncture in the historic dual Mars Exploration Rover (MER) mission to Mars will evoke strong emotions and memories among the hundreds of scientists and engineers who have worked on Spirit and millions of members of the public worldwide. They have followed the adventures of the 384-pound robot and its sister Opportunity as if they were human. If Spirit does survive, the science strategy for the rover as a fixed station should provide extremely important additional discoveries. Spirit can still perform major science that "holds the potential of for revealing major details about Mars that would add to Spirit's scientific legacy in a very meaningful and important way," Squyres tells Spaceflight Now. It is as if the now-fixed stationary Spirit has just touched down at another new Mars landing site. Squyres says these include major new data on whether Mars has a solid or liquid core and the acquisition of significantly more high resolution multispectral imagery of the Columbia Hills region of the giant Gusev crater area. Such data have not been obtained previously because it simply takes so long to acquire. But Spirit, if it can survive the coming winter power crisis, is now in a position to obtain such new data. 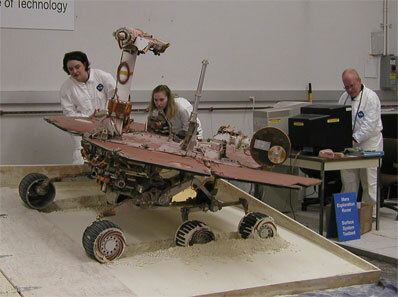 Months of simulation and analysis at JPL, Lockheed Martin and other NASA centers and companies could not solve the unsolvable, how to escape the sand pit with only four rather than six operational wheels. A third wheel is also in question. "Spirit has achieved so much and become such a significant vehicle in the history of Mars exploration we owe it to the rover and to ourselves that we are satisfied that we did everything we could possibly have done to get the thing out," says Squyres. But with the onset of Martian winter, a looming power crisis, and a worsening wheel capability it was too risky to trade the benefit of a fixed science lander against trying to drive Spirit out of the bizarre silica powder that overwhelmed its three left wheels last April. Ironically, the discovery of this silica is Spirit's greatest scientific achievement, Squyres tells Spaceflight Now. That is because for such extensive deposits of silica (90 percent pure opaline dioxide) there had to have been lengthy and abundant volcanically-warmed water at the Home Plate location. That cinched conclusions that the Home Plate site where Spirit is stuck was a volcanic fumeral not unlike those at Yellowstone or Lassen National Parks. 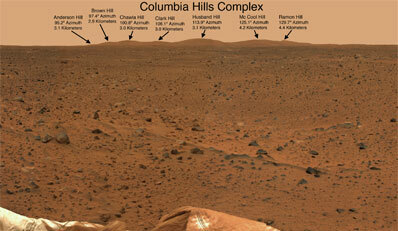 And some of this water could have been hospitable to Martian life. Spirit's right front wheel, unable to roll for most of the mission, complicated any hope of getting out, but the stuck wheel also made the initial silica discovery. Like a pioneer farmer with a single bottom plow to bust sod, the wheel dragging behind Spirit acted like that pioneer's plow, to turn over the bright white silica material under much darker topsoil. The bad news was months later Spirit's three left wheels fell through a camouflaged crust that concealed a pit of the slick powdery substance that entrapped Spirit. JPL rover drivers would have powered it out of the trap long ago had it been possible to do so. But both of Spirit's front and aft right wheels are inoperable now -- and even the right center may be acting up. Since Spirit is nearing electrical power limits to maneuver at all, it is likely virtually all future maneuvers will be devoted to further improving the attitude of Spirit's top solar array relative to the Sun. The new objective will be to shift to maneuvers to increase solar array power to survive the winter in the few days left where Sun angles will still provide enough power to ensure it can even do that minimal maneuvering in place. Until it eventually dies at this spot, this will help Spirit obtain more electricity to survive nighttime winter temperatures dipping to around minus 100 degrees F.
Both Spirit and Opportunity have lasted 6 years compared with their specification lifetime of about 90 days. Extremely complex mechanically, their robotic mechanisms had a specification travel distance of about 900 feet. Since landing late January 3, 2004, Pasadena time, Spirit has driven 4.8 miles. Its airbag landing was followed on January 24, 2004 by Opportunity, which has logged more than 12 miles. They have had substantially different missions on opposite sides of Mars. Both found important evidence of lengthily localized episodes of surface or underground water capable of sustaining life during early Martian history. And Opportunity continues to race its own lifetime (at a turtle's pace), toward massive Endeavour crater still more than a year of roving ahead. 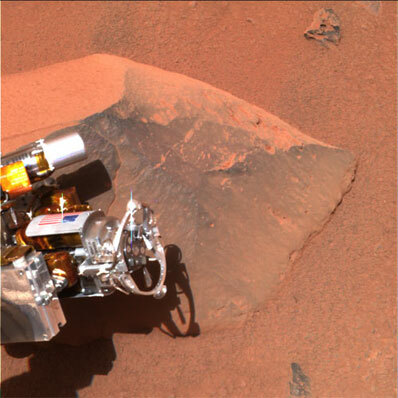 Spirit has had a much harder "blue collar" but amazing life even for geology-tuned Mars rover that built upon the airbag landing system pioneered in 1997 by the Mars Pathfinder lander and rover Sojourner. During landing, the Martian atmospheric density was somewhat less than programmed into Spirit's computer. This pushed its descent rocket firing to the latter part of the flight envelope, meaning the 10-foot-tall airbag system with Spirit inside descended far closer to the surface -- within a few feet of crashing before being yanked by its lanyard system to a neutral velocity state for release for the airbags to work. Two weeks after landing and finishing measurements on Adirondack, its first rock target, Spirit nearly died of a flash memory problem. It was solved in the end by JPL software engineer Glenn Reeves who during the software design had the foresight to include a INIT_CRIPPLED command in the system that fixed the flash memory problem after four days of no contact between Spirit and Earth. It saved the mission from software failure. But Spirit was still in scientific trouble because the expected riverbed or lakebed deposits were totally buried under uninteresting lava -- a heartbreaking find. The rover that was ostensibly specified for only about 900 feet of travel was then quickly dispatched on a scientific Hail Mary. She was aimed across difficult volcanic rubble toward the Columbia Hills two miles distant in search of water evidence on higher ground. The gamble worked and Spirit found increasing water evidence the higher it went. Spirit climbed her mountain, Husband Hill, reaching the top in late October 2005, dragging the frozen wheel behind it. It then carefully descended the mountain's backside to explore the mysterious baseball diamond-sized feature named "Home Plate." It was the extinct volcanic fumeral where she made her most important discovery, the silica deposits indicative of abundant volcanic-related water. Over the last several weeks, the rover team, using techniques developed by heavy work at JPL using two ground test rovers, have undertaken a systematic set of maneuvers on Mars in an attempt to drive out of the sand trap. None of it has worked, just like it never worked during all that grueling simulation work at JPL. But nobody can say it was not for a lack of trying both at JPL and on Mars. Since mid-January, Callas says they have tried driving backwards, south out of the trap instead of forward. That too provided minimal progress, except for one very significant benefit -- the back wheels tended to climb, elevating the solar array deck more directly north. This is a critical finding because the Sun will be low on the northern Martian horizon during the most dangerous part of winter. Any array elevation gain pointed north is more electricity in the bank for the winter. The climbing motion, however, means that the team may be able to park the rover in a somewhat better attitude for solar array power generation. "The other thing we might try once in optimum position is activate the right front wheel just to steer it back and fourth to literally try and grind it into the ground. That will tend to dip the right front side of Spirit and also pointing the deck more toward the north," Callas tells Spaceflight Now. The right front wheel will not rotate but it can be steered, meaning this technique could burrow it deeper elevating the solar array deck. From an electricity standpoint, the objective is to generate at least 160 watt hours per day during the worst of the winter on Mars, that will be during May in Earth terms. Spirit is currently running on 220 watt hours per day but that is decreasing on a daily basis. "We would like to have at least 160 watt hours available per day. But the energy predictions now are below that. That is why we want to get as much northern tilt as we can," says Callas. "Those predictions mean the rover will get colder and colder. If it gets too cold, it will damage critical electronics inside the warm electronics box of the rover," he says. "We would be running a daily energy deficit," that would likely eventually freeze Spirit. Hoping Spirit's demise can be at least postponed, a significant fixed rover science strategy has been built involving geophysics measurements, the monitoring of atmospheric and surface changes and geology and geochemistry measurements using the imaging systems and Cornell Athena science package spectrometers. 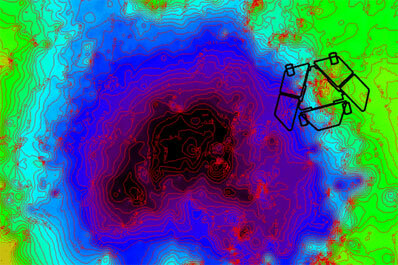 Geophysics: "The geophysics research is the one we are the most excited about," says Squyres. "By doing two-way X-band tracking of the rover's position on Mars when stationary, the team can determine the position of the rotational pole of Mars to extremely high accuracy," he says. "What that will do is very accurately characterize any wobbles in the planet's spin state related to whether Mars has a liquid or solid core,"
Most researchers believe the core is solid or mostly solid because of the lack of a strong magnetic field, but there is still debate on that. The rover geophysics measurements could settle the liquid versus solid Martian core issue. Atmospheric and surface changes: Wind blown material transport plays the primary role in sculpturing Martian terrain. The Cornell Athena science payload Pancam and Mini-TES thermal emission spectrometer mounted on the Pancam mast will continue daily monitoring of this phenomenon as has been done throughout the flight. They will also continue to monitor opacity and the appearance of clouds and other more dramatic features like dust storms and dust devils. That monitoring will continue, but be supplemented for more unique investigations like parking the microscopic imager over a single spot to observe how dust grains move. 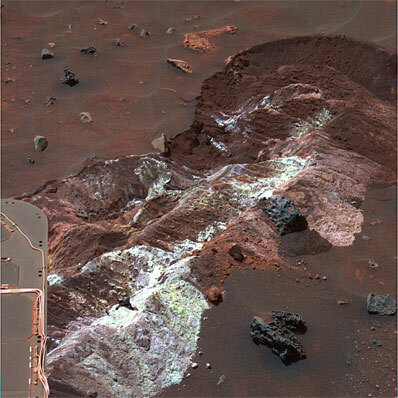 Earlier runs have shown that some Martian sand grains actually hop from place to place. "Albedo Pans" which are full 360-degree Pancam images will be continued to show atmospheric conditions in Gusev crater on a regional basis. Another fixed rover investigation will be important to understanding climate change on Mars. It will use the Cornell/Max Planck Institute Alpha Particle X-ray Spectrometer to measure the argon mixing ratio with carbon dioxide in the Martian atmosphere. "That ratio changes seasonally because C02 condenses out at the poles, but argon does not. So that argon/C02 ratio will change and can be measured with time based on measurements of the carbon dioxide at the equator where Spirit is. It will be a technique to quantify the mixing rate of Martian atmospheric gases," Squyres says. Geology and geochemistry: The Pancam and Mini-TES will also be used for long data takes aimed at the hills around where Spirit sits. There are several especially interesting volcanic features in the area. "We can effectively double the resolution of the Pancam by imaging a target then moving the instrument slightly so the computer can carry out a technique called high path filtering," says Squyres. It is a time consuming operation but can result in dramatic imagery. That will be done more often to study rock strata in nearby hills. In addition Pancam's extreme high resolution multispectral capabilities will used more often than time allowed in the past. "We will now be able to take the time needed to get extremely high resolution mineralogy data on the features around us, something we have not had time to do earlier," says Squyres. Closer to the rover "we have still got a lot of really interesting churned up soil around us. The reason we got stuck here is that this is not normal Martian soil. It is a really interesting mix of normal Martian soil but combined with high purity silica plus ferric sulfates. How all that came about is a mystery that Spirit will now have more time to solve. We have also found there is very complex layering to this stuff related to its water transport properties," says Squyres. To study it well requires the Mossbauer spectrometer. But the rover has been operating far longer than planned, given the unit's cobalt 57 atomic source to detect the molecules and atoms it is looking for in the soil. This is because the atomic half life of the cobalt is only 272 days, a duration exceeded several times already. The spectrometer still works. It just requires many days of placement on rock and soil targets to acquire the data it is looking for. With Spirit now a fixed science station, that Mossbauer capability will be used more often to unravel the complex geologic and water history of the site that Spirit has surrendered its roving life to solve.